The latest super seed to sprout on store shelves is ch-ch-ch-chia, a cousin of the seeds you once used to grow a crop of green hair atop your clay “pet.” This type of chia reportedly packs more alpha-linoleic acid, an omega-3 fat, than flaxseeds, and also provides fiber, antioxidants and even some calcium and iron. It’s also being touted for having cardiovascular benefits, reducing blood sugar levels and perhaps even squelching hunger pangs. Pros: In a 2007 Diabetes Care study of 20 people with type 2 diabetes, those who added about 4 tablespoons of Salba—a specific Salvia hispanica strain that’s been cultivated for its nutritional consistency—to their diets for 12 weeks saw improvements in blood pressure and reduced inflammation, a recognized risk for heart disease. In April, the study’s authors reported at an annual Experimental Biology meeting that healthy people who ate a slice of white bread containing as little as three-quarters of a tablespoon of Salba saw a drop in blood sugar levels and reported feeling fuller than after they ate plain white bread. Cons: Even for Salba, the published peer-reviewed science currently is limited to one small preliminary study. Although high in fiber, chia seeds are also high in calories. “The average American already gets a good amount of omega-3 fatty acids from the two major vegetable oils used in the U.S., soybean and canola oils,” says Alice Lichtenstein, D.Sc., director of the Cardiovascular Nutrition Laboratory at Tufts University and an EatingWell Nutrition Advisory Board member. “There are no data to indicate supplemental vegetable sources of omega-3 fatty acids will provide additional health benefits.” That said, eating chia seeds (the kind sold as food!) won’t harm you. 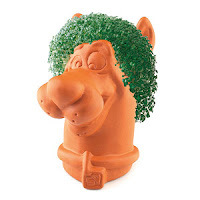 0 Response to "Eat your Chia Pet?"